Mark your calendars for the Tulare Union Drama Department's spring show on Wednesday, May 8 through Friday, May 10 at 7:00 p.m. with a 2:00 p.m. matinee on Saturday, May 11 in the Tulare Community Auditorium. Admission is $5 at the door. We hope to see you there! In the interest of student and staff safety, we have a modified closed campus policy. Students are not allowed to leave campus at any time during the school day, except during the lunch period, unless they have an off-campus pass. Maintaining a safe campus for all students and staff is a top priority. 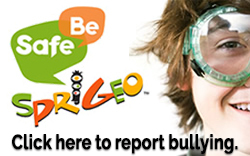 We follow a zero tolerance policy toward students who harass or threaten the safety of others. If your student has a safety concern, contact a member of the campus supervision team, a teacher, administrator, or counselor immediately.